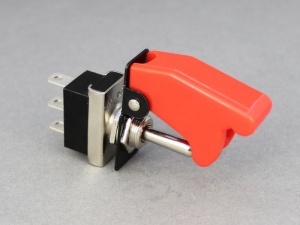 Hinged, sprung-loaded aircraft style guard for toggle switches that prevents accidental operation and automatically shuts the switch off when closed. 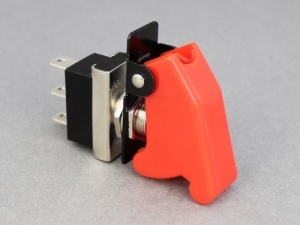 Fits toggle switches that have a 12mm dia. mounting thread and chrome metal lever (will not fit those with black paddle-style levers), however, because the guard throws the toggle when closed it is recommended for use with 1-way (ON/OFF or MOM/OFF) switches only. 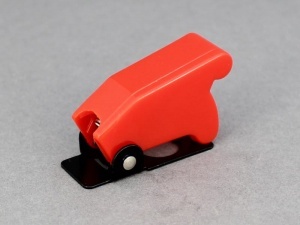 Mount so that toggle is pushed up to switch ON. Sold individually (switch not included). well made. adds a bit of fun and interest to your project.